Toyota Grand New Fortuner was launched in South Jakarta by PT TAM, a joint venture between Toyota Motor Corporation and PT Astra International at a price of Rs. 22.5 Lakh. The new model of Toyota Fortuner 4x2 SUV houses a 2.5LK-FTV VNT (Variable Nozzle Turbo) diesel engine in place of the previous 2KD-FTV engine. The new engine yields out a power of 142bhp with a torque figure of 343Nm, translating into more efficiency (41% more power and 32% more torque), as compared to its predecessor. Fortuner sales have ramped up this year and the SUV has already clocked in 10,000+ sales in the first half of 2012. The Indian version is also going to get a facelift this festive season, the current version houses a 2982cc 3.0-litre diesel engine and comes at a price of Rs. 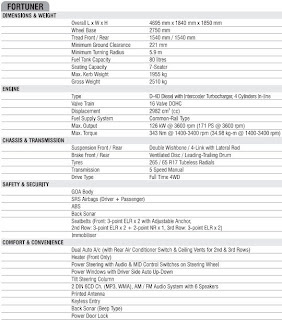 20.79 Lakh for the base model and goes up till Rs. 21.93 Lakh (ex-showroom New Delhi). 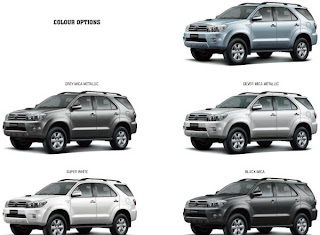 New Toyota Fortuner Prices shown here are indicative prices only.The New Toyota Fortuner Ex-Showroom price range displays the lowest approximate price of Toyota Fortuner 4x2 AT car model throughout India exclusive of tax,registration, insurance and cost of accessories. 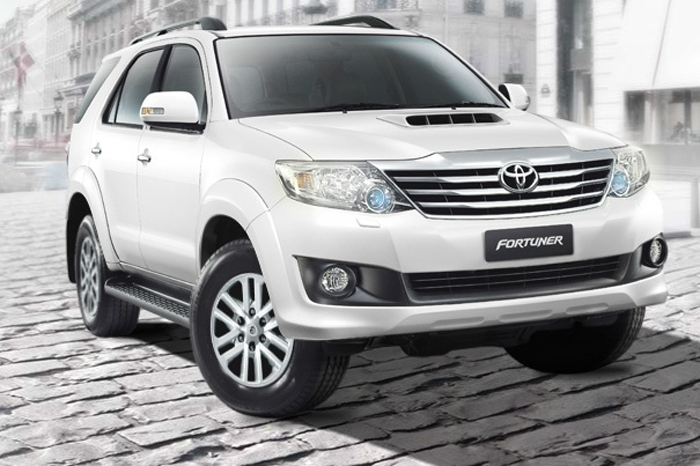 For exact prices of New Toyota Fortuner , please contact the New Toyota Fortuner dealer. 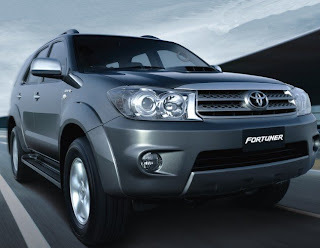 Toyota Fortuner is an impressive power machine with muscular body and its sporty looks can take anyone’s fancy. Toyota Fortuner facelift was displayed at Indonesian Motor Show in 2011. The mighty SUV is launched in various markets across the globe like Malaysia, Thailand, Oman, etc before coming to India. Toyota launched its very successful urban SUV-Toyota Fortuner in Indian market with only one diesel variant back in 2009. This mid-sized SUV, also known as Toyota SW4 in global market, is actually based on Toyota Hilux’s platform (It is a pick-up truck not present in India). The vehicle was originally designed by Toyota Technical Centre in Australia. It is assembled in India from CKD kits by Toyota Kirloskar Motors Pvt. Ltd.
Toyota Fortuner is an elegantly functional car, with its king size interiors and stylish exteriors. Even with one variant equipped with Toyota's most popular 3.0L diesel engine mated to five speed manual transmission gearbox and with 4WD (Four Wheel Drive) option, the SUV was capable of finding place in large garages of many Indian homes. 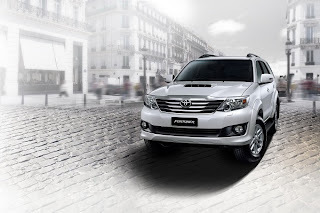 Such is the craze for Fortuner SUV that many a times the company has not been able to meet the overwhelming demand for this vehicle and had to stop the bookings. With the launch of Toyota Fortuner, Toyota planned to make its position strong in the premium SUV segment dominated by Honda CRV, Chevrolet Captiva and Ford Endeavour. The company has placed Toyota Fortuner in the highly competitive price range of Rs 18 to 20 lakhs in its segment. However, in the Auto 2012, Fortuner lovers were pleased to welcome the facelift version of this much adorable SUV at the Pragati Maidan in Delhi. Toyota Fortuner was initially launched only with a 3.0L diesel engine with 4WD (4 - Wheel Drive) that produces 168 bhp power and 343 Nm of torque, the engine mated to a 5 speed manual transmission. 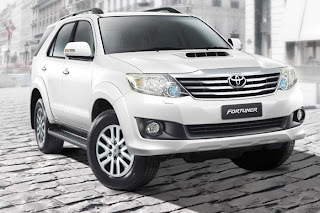 However in 2012, Toyota also launched 2WD (2- Wheel drive) models of Fortuner. Two more variants are added to the fleet-a 4 speed automatic and a 5-speed manual version. Same D4-D 3.0 lire diesel engine powers these two variants. Experts reveal that gearshifts are smooth and new Toyota Fortuner is perfect for City driving. Looks are the most important part of any vehicle that falls in SUV segment and this Japanese auto manufacturer does not disappoint in this regard. While those who own a Fortuner, drive it in pride and those who wishes to buy it stare at it as their dream SUV. Toyota Fortuner front appears aggressive and sheds dynamic look with strong bonnet lines and large head lamps that are placed next to the grille. The 2012 Toyota Fortuner grille is quite wider than the predecessor and the head lamps are angular now. Toyota Motors have dressed the front face of 2012 Fortuner SUV with new bumpers and a wider intake on bonnet for intercooler plus new alloy wheels have been added to change the side profile of the SUV. Ultimate comforts are bang on and the interior are extremely pleasing. Toyota has combined boldness and refinement in this model to present sporty and stylish looks. Its menacing front grille, black sporty side step with sporty roof rails and its 17" alloy wheels give it a killer look. The elegant interiors of Toyota Fortuner take inspiration from Land Cruiser styling. 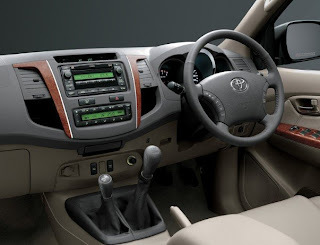 2012 Toyota Fortuner comes with newly designed centre console which is now equipped with a six-inch touch-screen which has also been added by Toyota in the new Innova. This so called infotainment system controls the audio system, the DVD player and reverse camera. A new Bluetooth telephony function has been added in the car and the new lighter steering wheel now comes with controls for the same. The driver seat gets six-way power adjustments and the instrument control is viewed better by Optitron dials which are revised for better visibility. The dual air conditioning system of Toyota Fortuner with automatic climate control system offers weather as per the needs of drivers and passengers during journey. The new 2WD Toyota Fortuner is equipped with double wishbone coil springs front suspension and non-independent rear suspension while the 4WD model has 4-link with lateral rod rear suspension that reduces the jerks and enhances the handling capacity which makes the driving more comfortable. Active safety features that you will find in Toyota Fortuner are Dual Front Airbags, ABS with EBD and ESP etc. Overall, Toyota Fortuner is a stunner is terms of performance and off-road handling. Toyota Fortuner 4x2 Manual This is the two wheel drive model powered by the same engine and a 5 speed manual transmission gearbox is given to Fortuner. 2WD will have better fuel efficiency than 4WD. Toyota Fortuner 4x2 AT This is the 2WD model powered by the same powerful diesel engine but this time mated to a 4 speed automatic transmission. Toyota Fortuner is available in diesel engine only. All the variants of Toyota Fortuner are powered by a 3.0L, 2982cc, Direct Injection Common Rail Diesel engine with Variable Nozzle Turbo. Toyota Fortuner four wheel drive model that is packed with this 3.0 L engine and mated to 5 speed manual transmission, offers mileage of 7 kmpl in city and 11 kmpl on highway. However, the mileage of two wheel drives of new Fortuner ranges from 7-11 to 9-11 kmpl. This will surely attract customers in India. 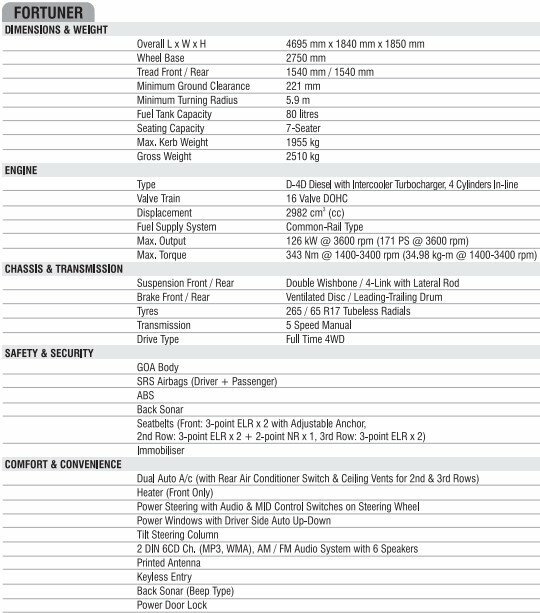 Toyota comes up only with the diesel variants of Fortuner equipped with a 3.0L, 2982cc, Direct Injection Common Rail Diesel engine which is able to produce 168 bhp of maximum power at 3600 rpm and 343 Nm of maximum torque at 1400-3400 rpm. This new Direct Injection Common Rail Diesel engine delivers high engine performance with excellent acceleration and fuel efficiency. Fortuner changes the definition of power. The turbo charger with intercooler keeps the performance level of this SUV at ace by cooling the compressed air that comes from the turbocharger before it enters the engine. Since, cooled air carries more oxygen, it results in better combustion. 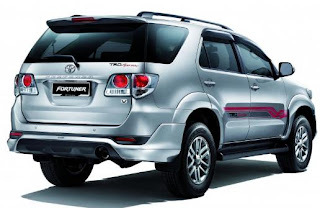 The original Toyota Fortuner was launched in four wheel drive version. This 4 WD (Four Wheel Drive) option is equipped with a 3.0L, 2982cc diesel engine mated to five speed manual transmission that also offers good acceleration and this model can also achieve the 100 kmph mark in just 9.61 seconds and can touch top speed mark of 176 kmph. However, Toyota has also added two brand new Two Wheel drive models, both packed with same 3 litre diesel engine. One of the 2WD models is manual, while the other is automatic version. While the top speed mark of these variants is same as 4WD, the acceleration comes to about 14.5 seconds (0-100 kmph). Following the footsteps of Hyundai, Honda, Skoda and many other car makers, Toyota is ready with a pan-model design approach. Toyota has tweaked most of its models to give them more or less a similar face so that they can be recognized as Toyota’s vehicle from a distance. The new SUV gets Toyota’s signature grille, logo and other family design elements. The 2012 Toyota Fortuner has already hit Indian roads. The changes on front of the new car are made for a fresher look. The wide grille has a lot of chrome on it with many slats. Headlamps are sleeker than the predecessor with self-leveling projector lamps. Headlamp washer comes as standard which looks like holding the sharp bumper on either side on which restyled fog lamps are fitted. Fog lamps accompany headlights is enhancing visibility. Moving upwards, the bonnet is marked by acute character lines and a wide air-scoop for cooling the intercooler. While many found the older look more menacing, others find charm in this new face. The SUV comes in new shades. On the sides, 17” alloy (aluminium) wheels have been tweaked for good. The over fender adds to the massive built of Fortuner SUV while the side step add a sense of sharpness to it. Body color electrically foldable ORVMs (Outside rear view mirrors) now get turn indicators on them, an added practical option in the SUV. Other things like roof rails, tinted windows, etc are same as before. Rare combination tail lamps with wedge-cut clear lens and within them lay dual circular lamps with better lighting. Printed antenna on the rear quarter window helps in reducing resistance from air and lends an unmistakable designer style. A new chrome bar steals the show from rear. On tailgate FORTUNER is embossed on the thick band. Rear bumpers are also different from outgoing model with reflectors placed low. Overall, Toyota Fortuner is a stylish SUV that comes with dynamic styling with its bold and aggressive appearance. Toyota Fortuner is a 7 seater SUV (Sports Utility Vehicle) model. The dimensions of the Toyota Fortuner are - its length is 4,695mm, width is 1,840 mm, height of this SUV is 1,850 mm and the wheelbase is 2,750mm. The ground clearance is 221 mm. The kerb weight of this SUV is 1955 kg. The interiors of the Toyota Fortuner are very attractive with dual tone beige dashboard that is packed with the advanced instrument cluster and beige upholstery. Toyota Fortuner offers stylish, spacious and comfortable passenger room with generous headroom, leg space and excellent front visibility. The interiors of Toyota Fortuner are designed to meet all the needs of passengers by providing a variety of convenient, multi-purpose storage places. In the 2012 Toyota Fortuner model, one would find, a fresh centre console that adorns a very sporty touch screen DVD audio system with Bluetooth mobile telephony. Controls of the same are given on the 4 spoke steering. A reverse camera is given to new Fortuner through which rear view can be seen on the touch screen. The dash now looks posh due to darker gray shade of Mock wood inserts while the centre console surrounds are brushed with aluminium. 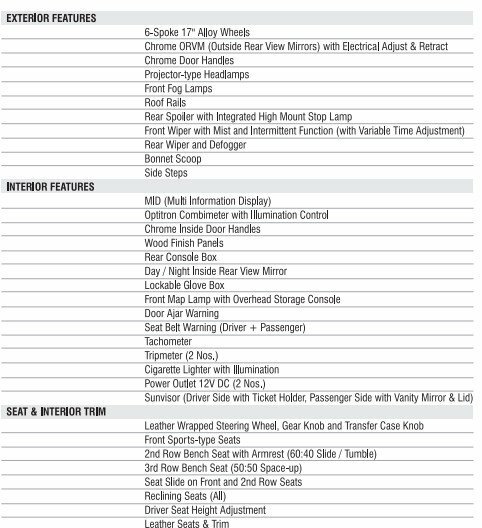 The driver seat gets six-way power adjustments and the instrument control is viewed better by Optitron dials which are revised for better visibility. Toyota Fortuner is an ultra spacious SUV that works as stress buster as it offers ultimate comfort with it. Its leather covered steering wheel which is tilt-able and adjustable and packed with the audio controls and Bluetooth offers comfortable driving experience. 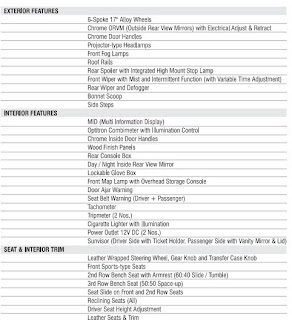 Other comfortable and luxurious features that Toyota Fortuner offers includes Automatic Climate Control AC with unique rear AC vents, Optitron Meter, Cabin lamp with Switch off Timer, MID (Multi Information Display), New Audio Head Unit with Bluetooth and Call Functions, Gate Type Shift Levers, Front and Rear Armrest, NVH (Noise, Vibrations and Harshness) Reduction Materials etc. Toyota Fortuner is availablein Indian market only with the diesel engine option which is powered by the high capacity longitudinally placed 3.0L, 2982cc, diesel engine that produces maximum power of 168 bhp at 3600 rpm and 343 Nm torque at 1400-3400 rpm. The turbocharged engine delivers high engine performance with excellent acceleration and fuel efficiency so that Toyota Fortuner never vibrates even after the speed of 130kmph. The turbo charger with intercooler keeps the performance level of this SUV at ace by cooling the compressed air that comes from the turbocharger before it enters the engine. Since, cooled air carries more oxygen, it results in better combustion. Earlier only 4 wheel drive version was present but in 2012 company will launch the two wheel drive versions, one of them has 4 speed automatic transmission. Power transfer will be done by the rear wheels as the automatic version is not available as a four-wheel drive model. As for the wheels, Toyota Fortuner is packed with stylish new 12 spoke 17” alloy wheels. Toyota Fortuner is packed with puncture resistant tube less tyres that makes it able for comfortable off-road driving. The tyre size of Toyota Fortuner is 265/65 R17. Its larger diameter wheels with puncture resistant tubeless tyres make it the best off-roader for Indian market. The front wheels of Toyota Fortuner are packed with large ventilated disc brakes while its rear wheel gets leading-trailing drum brakes. Its larger diameter disc brakes de-accelerate the car from 100kmph to 0 in just 3.14 seconds. ABS (Antilock Brake System) with EBD (Electronic Brake-Force Distribution) resists car to skid out of control in case of emergency braking. The new 2WD Toyota Fortuner is equipped with double wishbone coil springs front suspension and non-independent rear suspension while the 4WD model has 4-link with lateral rod rear suspension that reduces the jerks and enhances the handling capacity which makes its driving more comfortable. The newly developed double wishbone front suspension with a high mount type upper arm offers exceptional ride comfort. The automatic version is easy to cruise and its handling is like childsplay. Fortuner’s magnificent All-TERRAIN capability renders smooth and comfortable drive. 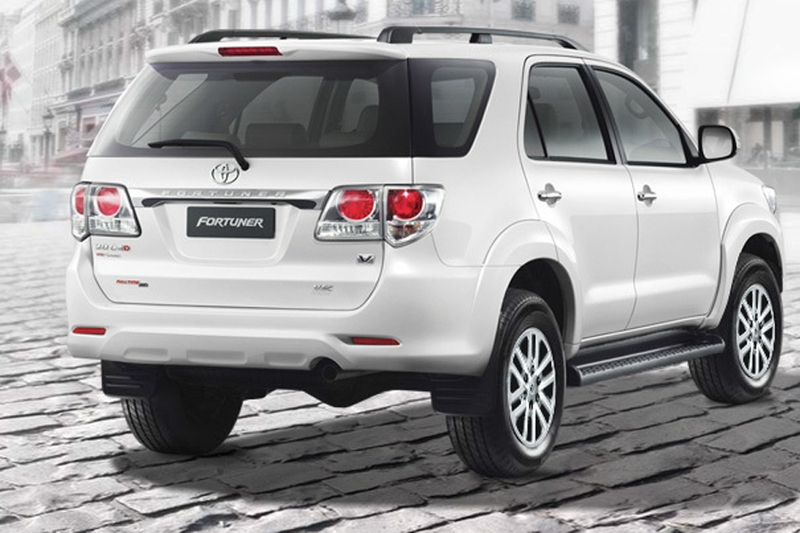 Toyota Fortuner offers lots of safety features for both driver and pedestrians. The active safety features that are available with Toyota Fortuner includes Dual Front SRS Airbags that greatly reduces the chance of injury in case of front collision, ABS with EBD that enables the driver to maneuver the vehicle even during hard braking, 15” Front Disc Brakes that de-accelerate the vehicle instantly. The other passive safety features that are available with Toyota Fortuner are Multi-Reflector Quad Headlamps, LED High Mount Tail Lamps, and GOA (Global Outstanding Assessment) body provides the highest level of safe body in its segment. Toyota Fortuner is packed with advanced touch screen which controls in-dash 2-din single CD/MP3 capable audio system and DVD player with six speakers that offers high quality audio entertainment. Its audio controls are mounted on its stylish leather covered steering wheel so that you can control audio system without distracting your eyes from road that enhances driving comfort. Its audio system with addition information display console that updates time, direction of driving, outside temperature and some other advanced functions. Toyota Fortuner is equipped with an effective and powerful climate control, dual air conditioning system with heater that offers the convenient atmosphere that passengers required. You can now buy New Toyota Fortuner accessories online. Great discounts available.